Something I learned only recently is that you can buy boxes covered in net, which are used for breeding fish, and they clip onto the side of the tank. 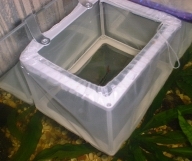 They cost only a few pounds, and mean that you can keep the fish segregated, while still in the same tank - so if you can't afford a quarantine tank, this is a good option for sick or injured fish. Of course, not all sick fish will need segregation, for example White Spot does not require affected fish to be separated and in any case, the whole tank should be treated if one fish is ill. However if you have a fish which is injured, for example is missing scale or fin, which is having problems with balance or which is hiding a lot of the time, it will do well from being separated in a breeding box. It can remain there while the tank is treated. Although it is a very good idea to diagnose fish illnesses correctly so they can be treated appropriately, and removed from the tank if contagious, there is a treatment available in the UK called Esha2000 which I find excellent. It treats a wide range of fungal, bacterial and parasitic diseases, and is great if you don't know the specific illness. It's even been found to prolong life in the case of dropsy. Unlike many treatments Esha2000 does not harm the filter, or the other fish. I can't recommmend it highly enough! Illnesses which need more specific treatment include white spot, internal flukes and internal bacteria, all of which are addressed below. When fish show illnesses it is possible they brought them from the shop if they are new arrivals - however not everyone has the luxury of quarantine, so it is better to choose a shop which you know will isolate fish before offering them for sale. However if they have been resident in the tank for a while, you should check the water quality. Many illnesses in my fish - such as cloudy eye - show themselves only under times of stress, for example when the filter has been compromised. Keeping the water quality high is very important to maintain a healthy tank. In order to treat the cloudy eye, the only thing I needed to do was clean up the water. In conjunction with appropriate treatment, you should ensure the water is properly filtered and clear. White Spot is common in new tanks, traumatised fish, or where new fish have recently been added to the tank. 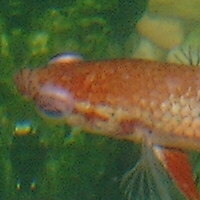 It shows as white spots like little grains of salt, initially on the tail and a little on the fins. Treat it straight away with a specific White Spot treatment, and as with many treatments, remove the carbon filter layer before treatment, and make a 25% water change after treatment is complete. Be really careful not to overdose. Although that treated my fish quickly and easily, you should also address the underlying cause. Traumatised or weak fish are more likely to suffer White Spot. These need treating with Sterazin, which is a long (10 day) treatment and symptoms appear to get worse before they got better. However it successfully treated my temperamental Pangassius catfish which developed an eye fluke: see this page for pictures and more details. With symptoms where the fish fattens up and its scales stick out like a pinecone you can be sure it has dropsy, a bad case of internal bacteria. Interpet has a remedy for this and Esha2000 has been found to prolong life in this case, but as it is contagious and nearly always fatal, I'd consider putting down affected fish or at least isolating them in a separate hospital tank. Another symptom of internal bacteria is popeye, where one or both eyes bulge out. The eyes remain clear unlike in cloudy eye. This afflicted my female betta and she died within the day. If the fish should die and its popeye rupture or its body be cannibalised by other fish, it can release bacteria into the water or infect other fish, so if you cannot isolate the fish it is worth considering putting it down as the chances of recovery are slight. My fish quite often peck each other. Slow moving fish with big fins are at risk of this, and I was shocked to find one fish with a fin which was barely sticks, and patches of bald skin. Fin rot can also cause damage. Fins will usually grow back unless they have wasted right to the body of the fish, so intervene well before this happens. I've had some guppies which were pecked to rags, and now have perfect fins which they show off around the tank, so don't despair. Just keep the water quality high. A great treatment in this case is Melafix which promotes skin and fin healing - however it is NOT an antibacterial despite claims to the contrary. You should also keep the fish separate in a breeding net (see above) until it has healed. Beware; fish with infections will often rub against tank furniture which can cause a loss of scales, so make sure you treat the cause. I have made changes to my tank to reduce the aggression (see Aggressive or Unhappy fish, above). Melafix is only the sticking plaster! An injured fish: pectoral fin worn away, skin red and sore. I have transcribed a fish symptom diagnosis chart, click here to read it. The following illnesses are covered: White spot, Velvet, Slime disease, Higher form parasite, Finrot, Mouth rot, Internal bacterial infection, Bacterial gill infection, Fungus, Swim bladder problem and Poisoning and water quality issues. Once you have a diagnosis, you can treat the fish accordingly.